Mick bests Jordy to take Rip Curl Pro Portugal win. Current ratings. 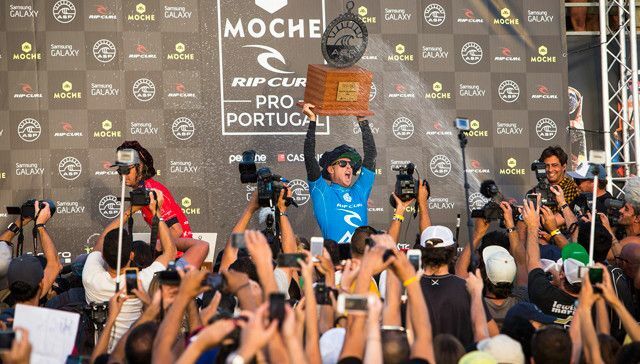 Surf News Network, 20 October, 2014: Supertubos, Peniche – Mick Fanning (AUS) has won the 2014 Moche Rip Curl Pro Portugal, defeating Jordy Smith (ZAF) in clean 3-to-5-foot barrels at the iconic Supertubos in Peniche. Fanning’s third event victory this season, after wins at Bells Beach and Jeffreys Bay, moves him up to World No. 2 on the Samsung Galaxy ASP World Championship Tour (WCT) rankings…..
….Following the event in Portugal, only reigning three-time ASP World Champion Fanning, 11-time ASP World Champion Kelly Slater (USA) and current World No. 1 Gabriel Medina (BRA) remain in contention for the World Title heading into the final event of the season in Hawaii.